Questionable Choices in Parenting day………………….ehhh, who the hell knows. My newest submission is this photograph. Here’s a quick game, let’s see how many things you can spot in this picture that are off just a tad and make you question my parenting skills. Where oh where should we start? 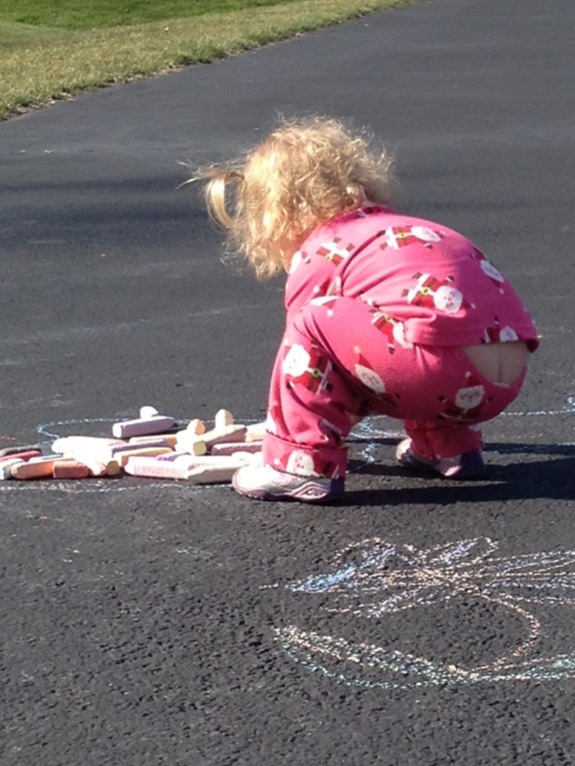 Well, for one, this is my kid playing outside in her pajamas. Yes, I let my kid walk around the neighborhood in her jammies. At least she has shoes on and the jammies match. I call this a success. Did you notice that she is wearing Santa jammies? Yup, too small Santa jammies, I might add. They were snug a few weeks ago, but here we are, in April, still sporting our December jammies. And the crème de la crème, the bees knees, the cat’s (or Santa in this case) pajamas, the cutest little carpenter crack I have ever seen. Those too small jammies and her super heavy diaper that needed changed before she strutted through the neighborhood are weighing her down and exposing her assets. I know photographers like to share their secrets and equipment. Well I used my fancy iPhone camera and snapped this pic while I lie on my back and let Monkey chalk an outline of my exhausted body. It would seem my need to take a nap and camera phone would put me at the perfect angle to catch this chalking crack. Listen, I don’t know the first thing about photography, but I know a talented gal that does! For my readers in Uniontown, PA and Morgantown, WV! The super talent Melissa Rosic is generously giving one lucky reader a Family Portrait session! Click the link below to enter! Lots of chances to enter! Share this with your friends! P.S. Tell your photography pal to come out my way! Mama wants some spring pics!